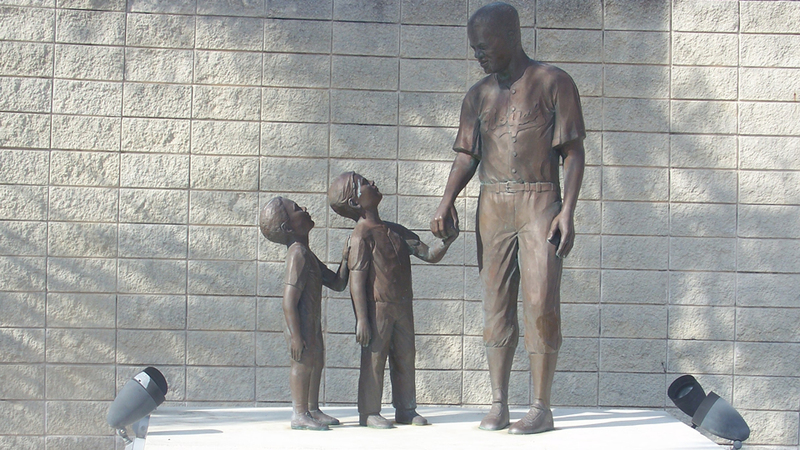 The statue outside of Jackie Robinson Ballpark marks the events of 1946, when Robinson spent Spring Training in Daytona Beach. "There's no ballpark like this. This is where history was made." That's how historian Bill Schumann describes Jackie Robinson Ballpark, home of the Florida State League's Daytona Tortugas (Class A Advanced affiliate of the Cincinnati Reds). The facility, which has gone through extensive renovations over decades, opened in 1914 as City Island Ballpark. It has consistently hosted Minor League Baseball since 1920, but the most impactful chapter of the stadium's long existence occurred in 1946. It was then that the City of Daytona Beach ignored existing Jim Crow-era segregation laws so Jackie Robinson, recently signed by the Brooklyn Dodgers, could play there. In 1946, Robinson was a member of the Triple-A Montreal Royals, the Dodgers' top farm club. He spent the entire season with Montreal, contributing mightily to a club that went on to win the International League championship. That set the stage for Robinson's epochal 1947 campaign with Brooklyn, where he kicked off his Hall of Fame career by breaking the Major League Baseball color line. But it all started in Daytona Beach, which renamed its ballpark in 1990 in honor of Robinson. This rechristening was spurred by Schumann's research efforts; he also was the founder of the Jackie Robinson Statue Committee. That committee's statue, located outside of the ballpark's main entrance, was unveiled at a 1990 ceremony attended by Robinson's widow, Rachel Robinson. "The theme of [the statue], he's passing on his contribution to future generations. One black [child], one white," Schumann said. "Notice he doesn't have a hat on. The reason that the artist did this was to make it less of a sports statue. ... He wore two different uniforms in Daytona. [The one depicted in the statue], he was wearing at a practice field in West Daytona called Kelly Field. And he has on the back there, No. 30. If this were in color today, this would have been white satin with royal blue stripes and belt loops. ... And he's pigeon-toed, which is what he was in real life." Schumann also produced a short video featuring Robinson playing at Daytona Beach, which the Tortugas show on the videoboard prior to their games. The video incorporates 16-millimeter motion picture footage, filmed by local fan Robert S. Bates. (Bates' son, George, served as the batboy that day.) This is believed to be the only film that exists of Robinson playing in Daytona. The ballpark was segregated at the time, with African-American fans seated in the grandstand down the right-field line. All of this leads to a simple question: Why was Robinson allowed to play in Daytona Beach when he wasn't welcomed elsewhere? The Dodgers had originally planned to have the Royals train in Sanford, Florida, but a hostile atmosphere prevailed and the Royals were run out of town due to the presence of Robinson and another African-American player, pitcher John Wright. Schumann credits Dr. Mary McLeod Bethune, founder of historically black Bethune-Cookman College, with creating the conditions that allowed Daytona Beach to host the Royals. "By the time 1946 had rolled around, [McLeod Bethune] had already worked with President Roosevelt. She was with his African-American cabinet and she was a key advisor," Schumann said. "And one of the things that's very important about that is that, at that time, we were under World War II and a depression. And with the Roosevelt administration, there was New Deal money -- they had a lot of federal money, and they had to decide where to spend it. Well, Mrs. Bethune had a hand in where money was spent and she was very good with politics. She knew how to build coalitions of blacks and whites, and I would say that the Roosevelts were not just friends of hers, they were political allies. She had political allies that were some of the most famous people in America." Among these individuals, Schumann mentioned oil magnate John D. Rockefeller (who wintered in Daytona Beach), Thomas White of the White Sewing Machine Company and members of the Gamble family (of Proctor and Gamble). "It was a different culture over there [in Sanford]," he continued. "They were not the same as Daytona Beach, because Dr. Mary McLeod Bethune changed the political culture of Daytona Beach with the way everybody worked together. ... She was like an American hero." Beyond the statue and the pregame video, the Tortugas continue to celebrate Robinson in a myriad of ways. In each of the past two seasons, the team has worn No. 9 uniforms on Jackie Robinson Day (April 15). This, a deviation from his far better-known No. 42, commemorates the number Robinson most often wore when he was in Daytona. Additionally, there is a "museum" element to the team's ballpark experience. The outside concourse is filled with plaques and interactive displays related to Robinson's career, including a broad-jump sand pit that illustrates the extent to which he excelled at track and field. And then there are the games themselves, which offer views very similar to those that fans watching Robinson enjoyed. "Home plate is, if not in the exact spot, then very close to where it was when Jackie Robinson was playing here," said Schumann. "So when people are coming up to bat, it's like where he really was. ... We want people, when they come to this ballpark, we want them to get the idea of what it was like to see the history take place." Benjamin Hill is a reporter for MiLB.com and writes Ben's Biz Blog. This story was not subject to the approval of the National Association of Professional Baseball Leagues or its clubs.